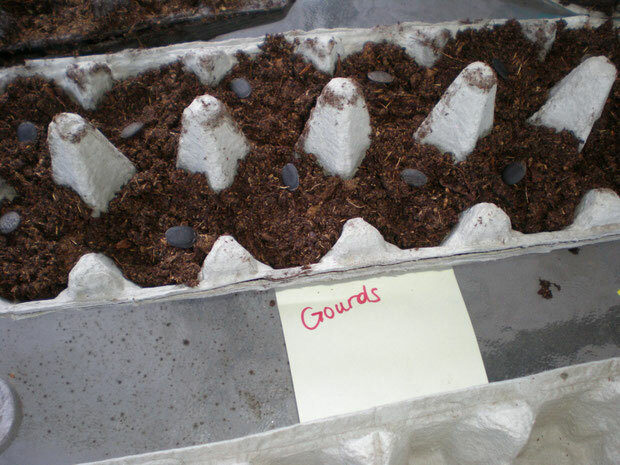 I would recommend starting your seeds using peat moss or peat pellets. 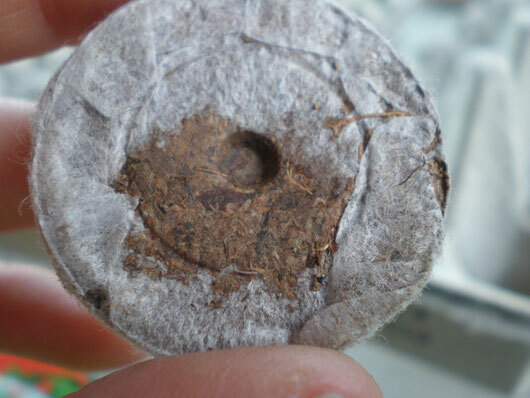 This is a peat pellet. We sell them here at the nursery. 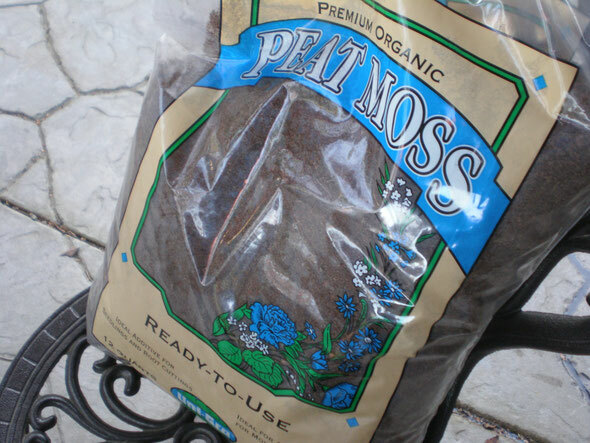 This is the peat moss I used. A very important key when using peat moss is that you must wet it beforehand. It tends to have a very dry consistency, so I would recommend putting it in a bucket with water and mixing it around really good, allowing it to absorb the water. After I wet the peat moss, I put it in my containers. 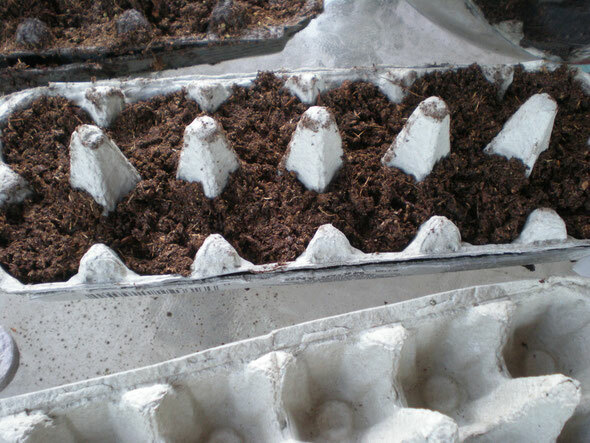 I used egg cartons, but you can also use small peat pots or any other small container. Egg carton with peat moss, ready for some seeds! Now you're ready to put your seeds in. I put mine in the top and pressed down to bury them if needed. 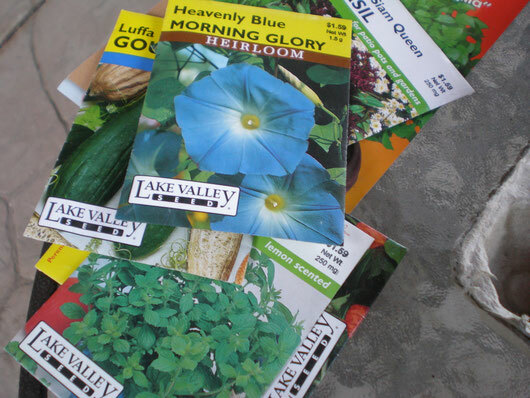 You will want to follow the directions on your seed packet for depth, but a general rule of thumb is the larger the seed, the deeper you bury it. With very small seeds, such as the basil and Chinese Lanterns I planted, barely cover them. These are my Luffa Gourd seeds, before I pressed them into the peat moss. After your seeds are covered, lightly sprinkle them with water. The key is to make sure the water never comes down in a hard stream, because this might saturate the peat moss too much, and might wash the seeds out or bury them too deep. I actually sprinkled the water by pouring my watering can over my fingers, then dripping the water down on the egg cartons. It might be worth it to invest in a watering can with a sprinkler pour spout on it. Keep your seed starts indoors in an area with bright indirect light. They will come up best if you make sure the temperature doesn't drop below 60 degrees. I will update this as my seedlings come up and I get ready to move them outdoors.